At the same meeting, Petrale sole, one of the marquee species on the West Coast, was also declared rebuilt. “Rebuilt” status simply means that the population of the fish has increased to a level above what is needed to sustain a healthy population. This target is set by the Council and aims to support maximum sustainable yield in the fishery. 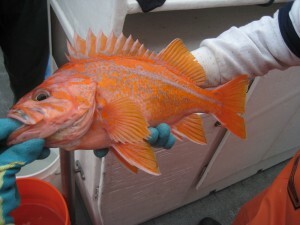 Under the initial rebuilding plan, populations of the bright orange and pink Canary rockfish were not expected to be rebuilt until 2057, so this rapid progress – attributed to a combination of favorable ocean conditions and strict conservation measures enacted under the West Coast’s catch share fishery management system – comes as particularly welcome news. Canary are one of the so-called “choke species” on the West Coast, meaning that assigned catch quotas of these fish are so small that fishermen have been effectively prevented from accessing large swaths of fishing grounds where plentiful target species co-mingle with Canary. In adapting to those low quotas and avoiding Canary rockfish in the first four years of the catch share program, fishermen have been instrumental in this major conservation win. When quotas for Canary are adjusted to reflect the six-fold increase in their population, fishermen will be less constrained in fishing those areas, and larger quantities of certified-sustainable fish will hit the docks in Washington, Oregon and California. EDF will continue working with the National Marine Fisheries Service and the Pacific Fishery Management Council to see that those quotas are adjusted as soon as possible.